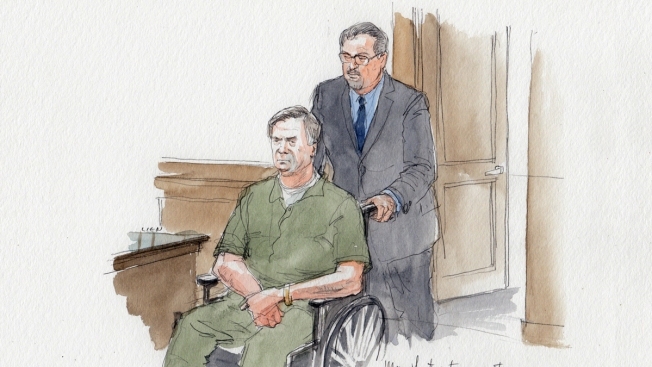 Paul Manafort enters courtroom in a wheelchair. White sock or bandage on right foot. Former Trump campaign chairman Paul Manafort rolled into a Virginia federal court Friday in a wheelchair and wearing a green prison uniform instead of his signature tailored suit. The judge scheduled Manafort to be sentenced Feb. 8 for eight counts of tax evasion and bank fraud and dismissed the remaining charges against him, NBC News reported. Manafort, appearing visibly greyer, was pushed into court in a wheelchair, missing his right shoe.